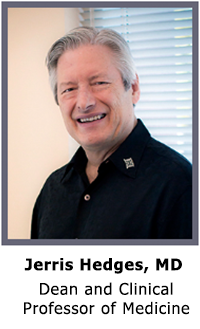 The University of Hawaiʻi Mānoa (UHM) John A. Burns School of Medicine (JABSOM) is led by Dean Jerris R. Hedges, MD, MS, MMM. He is also the Barry & Virginia Weinman – Endowed Chair. The Office of the Dean directs activities, personnel, and curricula in the School of Medicine and affiliated community hospitals and health centers. It is responsible for the direct liaison with other Schools of the College of Health Sciences and Social Welfare, the Graduate Division, community colleges and community agencies for collaborative instruction, research and community service. It establishes policies with the Schools’ Executive Committee to develop and implement the academic programs and coordinate continuing medical education, conducts accredited graduate medical education programs in community hospitals, and is responsible for general program development in accord with Legislative mandate and University of Hawaiʻi policies. The JABSOM Executive Committee is responsible for recommending policies to the Dean and for serving as the liaison between the Dean and the faculty by discussing all matters brought before it. The JABSOM Faculty Senate, which operates under separate bylaws, functions as a representative body of the JABSOM faculty. It obtains broadly based faculty input regarding affairs of JABSOM and makes recommendations to or advises the Dean and Executive Committee on all matters brought before it. The President and Vice President of the faculty senate are elected by members of the JABSOM senate and serve as members of the JABSOM Executive Committee.